The Bible is the most overrated book in world literature. Because it contains the basic writings of what is still the world’s largest religion and is printed in great numbers in almost every language, even people outside the Church attribute a certain quality to that book’s contents. The Bible benefits from a cult of the classics, which demands respect even from those who are not at all Christians. It is praised although most people have scarcely read it. And it undeniably has had an effect on history. However, having a historical effect does not necessarily imply a high quality of the contents. But there exists a dogged and persistent rumor that the Bible is valuable reading matter, that it mirrors not only a faith but also a worthy ethic, that it gives orientation and meaning, and so that it can be recommended for reading, particularly to adolescents. But that is false; or at least, it is no longer true today. The writings of the Old and New Testaments are ancient texts that not only no longer have any relations to modern society, but that in innumerable passages contradict the most elementary social and legal principles of modern, liberal society. Many patterns of behavior and premises of the Bible are inappropriate for people today; and in many passages, the Bible in fact shows in an exemplary manner precisely how not to act. This is not even a criticism: the Bible is a relic of a former time, a remnant from an epoch and a paradigm which rightly belong on the rubbish heap of history. The first chapters of this book are dedicated to a justification of this thesis: they provide an insight into the many abysmal, frightening, and absurd things in the holy writings of Christianity. The prestige and influence of the Churches was greater in the past. In ten to twenty years, people unaffiliated with the two major Churches in Germany will form the majority of the population. Although the Churches are becoming more humane and compassionate, rare behavior in their history, their faithful are still leaving them. On the other hand, the person of Jesus, their alleged founder, still enjoys undiminished popularity, even among expelled opponents of the Churches or devotees of the esoteric subculture. Jesus yes, Church no – that short formula describes the attitude of many contemporaries. It is a view of Jesus as a righteous man with a good message, whose violent death at the hands of the powerful can evoke honest sympathy even from non-Christians. But was Jesus’ message really so good? Is he really suitable as a model, let alone as a God to be adored? Historical researchers are mostly agreed that the Jesus proclaimed by the Churches, and even to some extent by the Bible, never existed. Just as the Bible is the most overrated book in world literature, so Jesus could be the most overrated figure in world history. A central chapter will therefore present the findings of scholarly research on who Jesus really was and what can definitively be attributed to him. It will also clearly mark out the shortcomings, limitations and sometimes abysmal notions of that wandering preacher from Galilee. The findings are not always agreeable for believers, or for secular admirers. Many would prefer to avoid such a detailed examination. What has the Church done with the teachings of Jesus? Did he really play a leading role in the fashioning of the Church and its doctrines? Did the Church show deference to him? Or was he rather only given the role of the janitor in the theological opera? These questions regarding the Church’s dogmas will be considered in connection with the chapter on Jesus, and there too the findings promise to be interesting. We then set out in search of those Christian values that are constantly invoked, not least in sermons by politicians. Everyone thinks they know what “Christian values” means, but actually defining them becomes harder the more intensely one examines them – like a fata morgana that gets increasingly fuzzy the more one tries to bring it into focus. A lot of what constitutes a modern polity has nothing at all in common with Christian roots or premises. Indeed, we should be relieved that our society is not based on the oft-invoked biblical or Christian foundations. Christianity is vastly overrated as a source of ethics and as the basis of a modern society. This book aims to shed critical light on the principles and the expressions of the Christian paradigm which has shaped Western history for more than 1,500 years. It points out the huge divergences and discrepancies between the teachings of the Christian Churches and the teachings of the man whom those Churches falsely cite as their origin. Scholarly research, especially research on the New Testament using scientific methods, has largely and adequately demonstrated the emptiness of the foundations of Christianity. The truth about Christianity is in principle no longer a question of belief, something one can decide for or against. Before one even gets to all the dogmas that require belief, Christianity has already failed the preliminary historical examination. Historical research has resolved the question of the truth of Christianity in a more enduring way than all the libraries devoted to dogmas ever could have. The question of a decision is no longer raised at all; the question now is merely whether one is personally ready to accept these results or to close one’s eyes to them. The Christian paradigm can be regarded as disproved, and the question of its truth as resolved – with a negative answer. That is so despite the fact that Christianity itself will certainly continue to exist for centuries, just as the Germanic and Roman deities lived on for centuries after the victory of Christianity. Though the closing bell has sounded on religions, the patrons are not willing to let even the most experienced host turn them out onto the street. The Churches, as sociological and institutional entities, are pertinacious in their ability to stay seated. The faithful want to believe, and they can only be approached with great difficulty with arguments in this area, which for them is a matter of life and death. Nevertheless, or for that very reason, critical arguments are not a waste of time; they are all the more necessary. This book is therefore addressed to members and friends of the Christian Churches who are not afraid to be confronted with ideas that question the premises on which their lives and beliefs are based. It may open them up to new insights and lead to a better exploration of reality, but it may also make habitual, comfortable perceptions appear dubious and shallow. They may feel some discomfort, but perhaps it will be all the more eye-opening. The book is also directed to critics of Christianity and to those who have always had an inkling that something must be wrong with Christianity. This book will give them the opportunity to support their correct feeling with arguments. In fact, there is quite a lot to be said about Christianity as it exists today and about how it developed. Hence this book should be viewed as being in the best Enlightenment tradition. One must not concede the argument that the Enlightenment is old hat, and in particular that criticism of religion is a relic of the 19th century— certainly not as long as the opposite is preached every Sunday in innumerable churches. 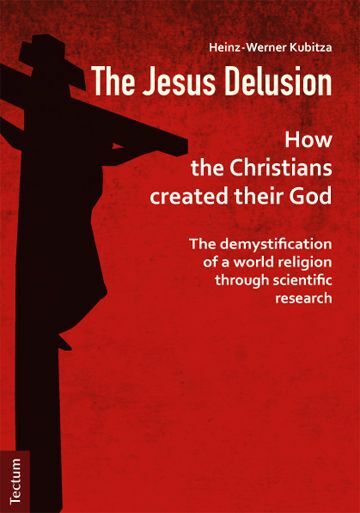 However, this book is not a contribution to a systematic atheism. It deals exclusively with Christianity, the main religion in the author’s cultural sphere. Christianity is also the religion which has been most closely examined by scholars. Certainly there is a strong suspicion that other religions, if they were seriously submitted to scholarly research, would be found to be equally shaky. Let us clear up a misunderstanding right from the start: the words Jesus delusion in the title of course do not imply that believers are somehow religious “madmen”. One finds decidedly likeable and friendly people among Christians and the clergy. The purpose is also not to defame believers or their beliefs. But even among critical and non-religious persons there can sometimes be found an interesting phenomenon, islands of irrationality; think for instance of the Karlsruhe philosophers who are convinced of the truth of homeopathy, or of politicians who regularly read horoscopes. Sideways leaps into superstition, which seem to be a quirk with such people, form part of the essence of religious believers; they form the foundation of their entire world view, and they are a permanent sin of adultery against reality. Of course believers do not want to think of themselves as superstitious. But as historical and other research has shown, the Churches and their dogmas are precisely that: forms of organized irrationality. Believers simply have to put up with the fact that assertions such as the one that a God the Son, having become a man, died on the cross for our sins, that he was resurrected from the dead, and that he is a part of a divine Trinity, are being dragged out of the ecclesiastical darkness and the mustiness of the confessional into the comparatively bright light of historical observation. Doggedly clinging to traditional and allegedly eternal and sacred doctrines despite the clear evidence of their historical development, asserting that there is an imaginary world apart from the world that can be empirically experienced, or the expectation of a Hell with eternal tortures or a Paradise (with or without virgins) as well as a life after death – all these really are features of delusion.